Y’all know that I am passionate about car seat safety. So I’m super excited to bring you a giveaway to promote Child Passenger Safety Week! ! Here’s your opportunity to learn a little more about Child Passenger Safety and maybe win a $100 Amazon gift card! After you enter the giveaway, make sure you tell me in the comments what you’ll do with the money if you win! Good Luck! I am sharing this post as part of a Bloggin’ Mamas Social Good Campaign, and was not compensated for doing so. Blog­gin’ Mamas is sup­port­ing the Ad Coun­cil and The Depart­ment of Transportation’s National High­way Traf­fic Safety Admin­is­tra­tion (NHTSA) by shar­ing the word about Child Pas­sen­ger Safety Week (September 13-19, 2015) and National Seat Check Saturday (September 19, 2015). Did you know that motor vehicle crashes are a leading cause of death for children age 1 to 13 in the USA? In 2013, a child under 13 was involved in a crash every 33 seconds. One of the goals of Child Passenger Safety Week is to encourage parents and caregivers to visit SaferCar.gov/TheRightSeat; to determine if their child is in the right seat for his or her age and size and to locate a car seat inspection event in their area. Additionally, parents and caregivers will be urged to register their child’s car seat with the manufacturer so as to be informed in the event of a recall. Find a car seat that fits your child. As children grow, how they sit in your car will change. Make sure the car seat you purchase is designed to fit your child’s current size and age and allows some room growth. Before putting your child in a car seat, read the manufacturer’s instructions so you know how your car seat works and how to install it. All-in-One car seats offer you the advantage of using the same seat for the following positions: rear-facing, forward-facing with harness, then booster. These seats typically have higher height and weight limits for the rear-facing position, allowing you to keep your child rear-facing for a longer period of time, which physicians and safety experts strongly recommend. Children ages 1-3 should be kept rear-facing as long as they fit the car seat. Have more questions? 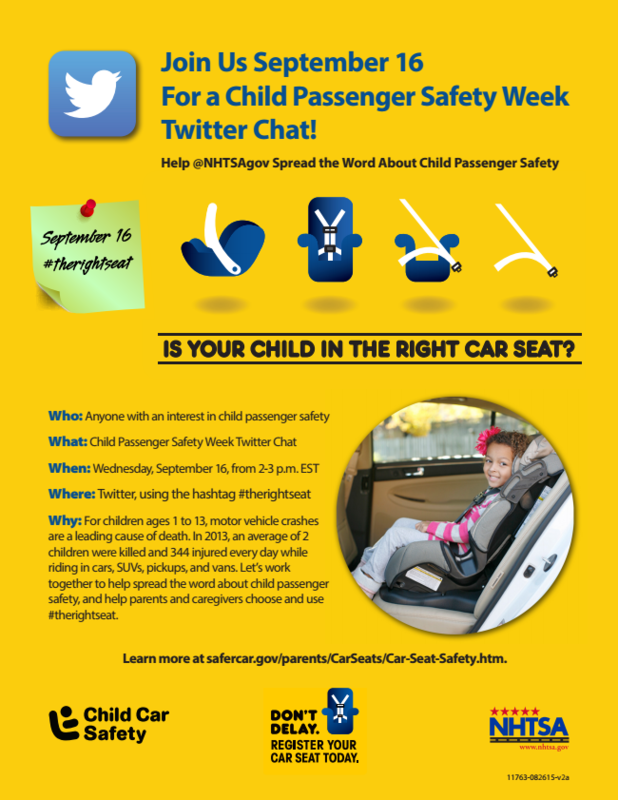 Join the Child Passenger Safety Week Twitter Chat on 9/16/15 2p-3p EST. Follow @NHTSAgov and #therightseat. 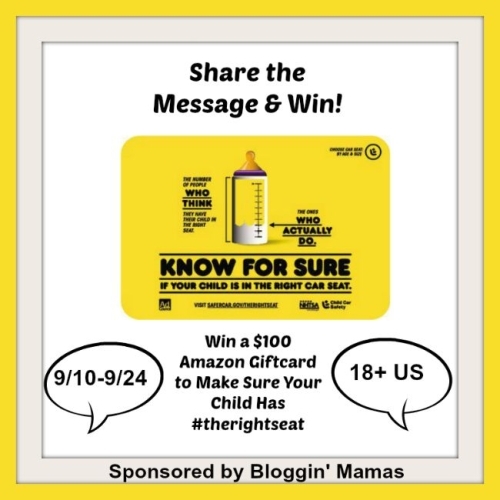 To help you make sure your child has #therightseat, Bloggin’ Mamas is sponsoring this $100 Amazon Giftcard Giveaway! Give­away begins Sep­tem­ber 10th, 2015 at 12:01 am and ends September 24th, 2015 at 11:59 pm EST. Open to US res­i­dents age 18 and older. Win­ner will be selected by Random.org and be noti­fied by email. See Giveaway Tools wid­get below for full terms & conditions. Dis­clo­sure: Starfish Confidential has not been compensated in any way for this post or giveaway and is not responsible for prize fulfillment. Blog­gin’ Mamas is host­ing this give­away and coor­di­nat­ing prize ful­fill­ment. Ele­ment Asso­ciates, The Ad Coun­cil and the NHTSA are in no way respon­si­ble for the give­away, and only pro­vided the above con­tent to be dis­trib­uted in the form of a PSA. #AdoptionTalk: Four under 4 is nuts! How far should you go to keep siblings together? Four under 4 is nuts! When Lil Bit was sheltered, and placed with a relative who had no intention of adopting him, I fought (and fought) to have him placed with us. Not because I wanted another boy (remember I said no more boys three boys ago), and not because I was in a hurry to adopt a third child – but because siblings are important. Squirm has 6 older siblings (that we know of). I know where three of them are and will be able to give him some direction when he’s older and ready to find them. I would love to start play-dates with them now, but they don’t know he exists. And their adoptive parents apparently plan to keep it that way. I have no idea where to even start looking for his three oldest siblings. So when it looked like he was going to lose another sibling – because this relative wanted to give her friend a child – I got mad. And I got vocal. Eventually, when Lil Bit was about 3 weeks old, the relative officially stated that she had no intention of adopting him, and the paperwork was finally started to move him to our home. He was four weeks old when he came home – exactly one week before his first Christmas. People frequently ask if Lil Bit and Squirm know they are biological half-brothers. I honestly don’t know. They definitely know they are brothers and that Squish doesn’t look like them, but I have no idea if they realize they’re related to each other in a way they’re not related to Squish. We’ve discussed the fact that Lil Bit and Squirm have the same first mom, and Squish has a different first mom, but I have no way of knowing how much they understand. Obviously, they’ll know someday. And I worry sometimes that Squish will feel left out because he doesn’t have a biological sibling in our family – or because he’s the only blond. SuperDad and I have recently agreed that we are done adopting. We want to foster for a long time and if we adopt any more kids, we just aren’t going to be able to continue. The addition of Squeaker has proven to us, unequivocally, that four kids under age 4 (all in diapers) is nuts… And it doesn’t help that she doesn’t appear to be anywhere remotely near sleeping through the night…. So one question we will probably have to address at some point – if Squish and Lil Bit end up with another biological sibling, are we willing to take that baby, if necessary? At least right now, the answer is “probably not”. Even a few months ago I wouldn’t have even considered turning away a biological sibling, but…. four under 4 is nuts! It’s crazy to me to think of saying no, and I feel a little guilty even contemplating it. But SuperDad and I have realized that the last thing we want is to get to a point where Squish has a new sibling that needs a home – and we have to say no. And the worst case would be continuing to say yes until we’ve gotten ourselves more children than we can handle. Four under 4 is nuts and, quite frankly, anything beyond that is terrifying. We haven’t done a giveaway in a while, and I thought this one would be fun. Who couldn’t use an extra $100 this summer, right? Enter below and then tell me in the comments what you’ll do with the money if you win.